Autobiographical storytelling is an incredibly therapeutic process and Storycorps has been tapping into its healing qualities for over ten years now. It was 2004 when founder Dave Isay first set up a booth in Grand Central Station to conduct interviews with the American public. Over the following eleven years the non-profit has grown enormously, collecting over 65,000 interviews, which now form a searchable library of American voices telling their own oral histories. Storycorps has always believed that the best interviewer is someone who is part of the subject’s life, but it has previously been limited by its original model — which relies on facilitators to assist in the interview process in one of the companies’ touring booths. 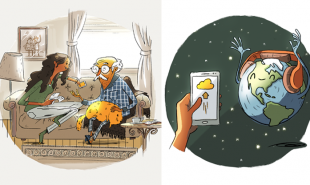 Now, following a USD 1 million prize fund from TED, the organization has developed an app which will enable anyone, anywhere, to conduct a Storycorps interview and automatically add it to the archive. Users simply download the app, which is available on iOS and Android, and use the guidelines to help them interview a friend or loved one. Interviews can be any length — the organization suggests that between 15 and 40 minutes is ideal — and the app provides suggested questions and tips to make the most the of the conversation. 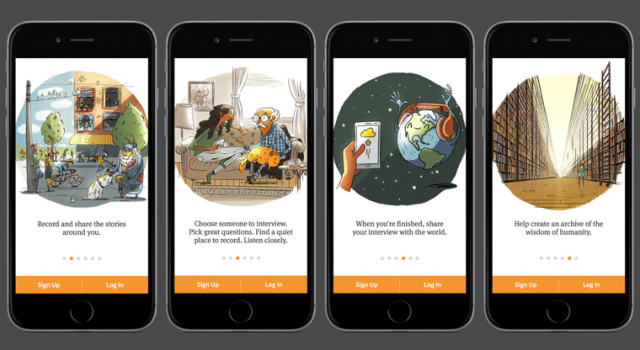 Afterwards, participants can share the results with friends and family and they can choose to have the chat added to the Storycorps website and sent to the American Folklife Centre at the Library of Congress. Alternatively, they can simply use the process as a way of shining a light on unique lives that might otherwise remain uncelebrated. Is this a project that could work outside of America, perhaps as a way of enabling different cultures to understand each other?